Thirty years ago, I decided to become a speech-language pathologist because it integrates all of the things I love: altruism, written and spoken language, aging, the brain, and most importantly, creativity. In making this choice, I envisioned it would be a path linking the art and science of human communication. Travelling this path, I’ve been able to work with hundreds of adults who have had a type of neurological surprise resulting in long-term rehabilitation. The surprise that brought my patients to me has frequently left them with a chronic disability. As a professor, I’ve had the additional privilege of teaching future speech-language pathologists about intervention and assessment of adults in communication rehabilitation. Through both lenses of teacher and clinician my perspective is of the “humanness” of the craft. Speech-language pathologists are here to help the person. We do this by recognizing the importance of the big picture in rehabilitation: that is, the everyday lives and functional communication goals of adults after stroke, traumatic brain injury, or other neurologic disease. Thinking about these big-picture, functional goals, we should not seek to isolate language and speech from their natural objective of interacting with another human, nor should we ignore other forms of communication. To that end, many clinicians, myself among them, have sought to use modes of artistic expression to link humanistic endeavor with the science of clinical work. Language and drawing skills are viewed as having some parallels.1 Thus, it is logical that they are utilized as an intervention for those with language disorders. Drawing has long been a way for people with speech and language impairments to show communicative intent. “Back to the Drawing Board”2 represents the only systematic intervention that teaches adults with aphasia to use drawings to augment their verbal skills. It has been successful with some severely language-impaired adults to compensate for otherwise limited expression. The website AphasiaNow.org shows examples of people who turned to drawing, painting, sewing, and musical instruments after stroke as a way to communicate. Acting appears as a therapeutic tool in rehabilitative speech-language pathology, most often in the form of role-playing, and is involved in several therapy programs such as the Eight Step Continuum for treating apraxia of speech.3 Role-playing requires the imagination to propel one’s self into another place and time. In the role-playing therapy session, the speech-language pathologist and patient create and act out a scenario that allows the patient to utilize specific communication strategies to ensure they communicate what they want appropriately. For example, the patient and speech-language pathologist may set up a scenario in which the patient acts out ordering food in a restaurant. Although this stage is small, the ability to use imagination to think about being in a different place and time and the use of scripts are forms of acting that can be very beneficial to improving communication. The reading of poetry to post-stroke patients along with other art activities has many mental health benefits, but the use of poetry within speech-language as a tool to improve speech, language, and cognition is understudied, and perhaps underutilized. Shafi and Carozza offer suggestions for including poetry in aphasia rehabilitation, as well as potential benefits.4 Included in this are possibilities for group therapy, the appropriateness of poetry for non-fluent aphasia, and the attractiveness of poetry for its multimodal language components (e.g., reading, writing, and reciting). One case study shows the benefits of using poetry with adults with aphasia. Pinhassi-Vitorrio reported a patient who was able to successfully use written poetry as a form of expression and communication.5 This was particularly important for the patient since spoken communication was quite limited. Poetry may therefore be a tool for expression otherwise not available for people with limited language. Given poetry’s metaphorical properties, it may also be very appropriate for use with right hemisphere stroke patients who are exhibiting problems with using and understanding figurative language. Problems with metaphors and other figurative language aspects are often difficult for those with right hemisphere damage (RHD).6 Therefore, poetry could be an effective tool for RHD patients to help improve their use of abstract language. Speech rehabilitation involving the use of poetry with patients who suffer from dementia illustrates how poetry benefits people with cognitive impairments. Such programs as reminiscence-based poetry activities7 and poetry writing intervention8 show some benefits for those with dementia or for caregivers of adults with dementia. Within speech-language pathology, these programs can offer a way to communicate or maintain communication skills. Because the role of speech-language pathologists in treating patients with dementia is primarily assessing cognitive-communication skills and providing recommendations for one’s environment (including development of maintenance programs), the use of reading poetry or using poetry to facilitate memory recall may be helpful to incorporate into maintenance programs. Music has been explored clinically both as a way to understand the neural regions of language and music and to facilitate language processing.9 Additionally, we consider the melodic components of speech—prosody—as a variable of speech intelligibility in dysarthric speakers. As an intervention technique music may be one of the most widely explored of the humanities applied to speech-language pathology, especially in the area of aphasia and apraxia of speech. There are many anecdotal and documented cases of individuals with these communication disorders who are able to produce speech and language accurately while singing, but who cannot do the same during propositional speech. One of my fondest memories of the impact of using this ability with a severely apraxic and aphasic patient is when I had a patient sing “Happy Birthday” to her daughter. This performance was the first time since her stroke that the patient’s daughter had heard her mother verbalize more than a word or two. Needless to say, there were many tears and smiles in the room at that moment; it illustrates the power of communication through music. A particular intervention technique related to language and music, Melodic Intonation Therapy (MIT),10 utilizes the brain’s ability to produce highly accurate language and speech using an exaggeration of the natural melody of speech. Melodic Intonation Therapy is a structured approach that relies on a hierarchy of tasks involving prosodic exaggeration, finger tapping, and eventual typical production of a short phrase. Its use for over forty years speaks eloquently about its success with many patients speaking many different languages,11 particularly for those with left hemisphere stroke and fairly intact auditory comprehension skills. Viewed from a global perspective, music can also be important for communicating with others through a nonverbal mode. For instance, a friend of mine living successfully with aphasia had a mild anomia most apparent during conversation. Prior to his stroke he was an avid singer; after his stroke, he wanted to continue to live his passion for singing. So, he joined a choral singing group and found that his anomia was not a hindrance during his performance. For him, singing with others allowed him a way to communicate and connect with other people and enhanced his communicative self. Relatedly, I worked with a woman with severe apraxia of speech who was a piano teacher prior to her stroke. Although hemiparesis affected her dominant hand, she was able to play slowly with the other hand. We incorporated a keyboard into her speech therapy and she lit up. Her speech seemed to be somewhat facilitated by the notes, and that discovery appeared to be a gift that motivated her. I began this Perspectives piece by highlighting the importance of the big picture: the everyday lives and the functional goals of the people who are being helped by speech-language pathologists. The humanities constitute an important piece of addressing the big picture, as they allow our patients to express themselves not just through speech and language, but through music, painting, photography, and other expressive outlets. The humanities are part of the “humanness” of speech-language pathology. Both contemporary and past speech-language pathology practices have benefited from the humanities, and as speech-language therapy evolves further, the humanities will continue to contribute substantially to the discipline. Breckinridge Church R. It’s not just about drawing and language… it’s really about reconceptualizing the roles of nature and nurture. Hum Dev. 2012; 55(4): 199-204. Morgan AL, Helm-Estabrooks N. Back to the drawing board: a treatment program for nonverbal aphasic patients. Clinical Aphasiology. 1987; 17: 64-72. Rosenbek JC, Lemme ML, Ahern MB, Harris EH, Wertz RT. A treatment for apraxia of speech in adults. J Speech Hear Disord. 1973; 38(4): 462-472. Shafi N, Carozza L. Poetry and aphasia: a clinical outlook. J Poet Ther. 2011; 24(4): 255-259. Pinhasi-Vittorio L. The role of written language in the rehabilitation process of brain injury and aphasia: the memory of the movement in the reacquisition of language. Top Stroke Rehabil. 2007; 14(1): 115-122. Bottini G, Corcoran R, Sterzi R, et al. The role of the right hemisphere in the interpretation of figurative aspects of language. Brain. 1994; 117: 1241-1253. Gregory H. Using poetry to improve the quality of life and care for people with dementia: a qualitative analysis of the Try to Remember programme. Arts Health. 2011; 3(2): 160-172. Kidd LI, Zauszniewski JA, Morris DL. Benefits of a poetry writing intervention for family caregivers of elders with dementia. Issues Ment Health Nurs. 2011; 32(9): 598-604. Patel AD. Language, music, syntax and the brain. Nat Neurosci. 2003; 6(7): 674-681. Albert ML, Sparks RW, Helm NA. Melodic intonation therapy for aphasia. Arch Neurol. 1973; 29(2): 130-131. Bonakdarpour B, Eftekharzadeh A, Ashayeri HA. Preliminary report on the effects of melodic intonation therapy in the rehabilitation of Persian aphasic patients. Iran J Med Sci. 2000; 25: 156-160.
van der Meulen I, van de Sandt-Koenderman ME, Ribbers GM. Melodic intonation therapy: present controversies and future opportunities. Arch Phys Med Rehabil. 2012; 93(1): S46-S52. Helm-Estabrooks N. Exploiting the right hemisphere for language rehabilitation: melodic intonation therapy. In: Perecman E, ed. Cognitive Processing in the Right Hemisphere. New York, NY: Academic Press; 1983: 229-240. Schlaug G, Marchina S, Norton A. Evidence for plasticity in white‐matter tracts of patients with chronic Broca’s aphasia undergoing intense intonation‐based speech therapy. Ann N Y Acad Sci, 2009; 1169(1): 385-394. Gordon H. Music and the right hemisphere. In: Young A, ed. Functions of the Right Cerebral Hemisphere. Vol. 3. New York, NY: Academic Press; 1983: 65-83. Ross ED. The aprosodias: functional-anatomic organization of the affective components of language in the right hemisphere. Arch Neurol. 1981; 38(9): 561-569. Tamplin J. A pilot study into the effect of vocal exercises and singing on dysarthric speech. 2007; 23(3): 207-216. Hegde S. Music-based cognitive remediation therapy for patients with traumatic brain injury. Front Neurol. 2014; 5: 34. Hobson MR. The collaboration of music therapy and speech-language pathology in the treatment of neurogenic communication disorders: part II—collaborative strategies and scope of practice. Music Ther Perspect. 2006; 24(2): 66-72. Dr. Laures-Gore graduated from Iowa State University with a Bachelor’s of Science in Speech Communication followed by a Master’s of Health Science in Communication Disorders at the University of Missouri-Columbia. She practiced as a full-time speech-language pathologist in rehabilitation environments for five years before pursuing doctoral training. She received her PhD in Communicative Disorders from the University of Wisconsin-Madison in 2001. She joined the faculty at Georgia State University after obtaining her PhD and is currently an Associate Professor. Dr. Laures-Gore is also the Director of the Aphasia and Motor Speech Disorders Research Lab at Georgia State University. 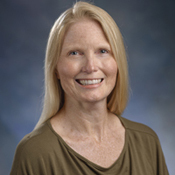 She has numerous publications and presentations in the area of adult neurogenic communication disorders and has been the primary investigator of multiple grants.